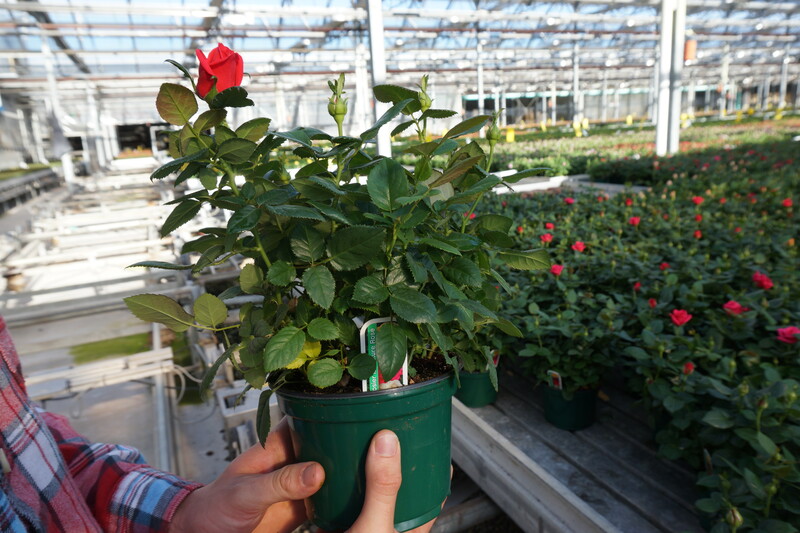 DAY 1- #PotPlantStudyTourOntario We started on the study tour with a bright day leaving Mississauga and visiting Aldershot Greenhouses in Burlington to see their pot rose production. As we came through the work hall, the first thing we saw was the rose sticking machine which allows them to produce up to 3M pots of beautiful, high quality Poulsen roses (10 & 15cm) per year with reduced labour input. Manufactured in cooperation with a Dutch company and locally, their machine, grading and sticking 4 cuttings per pot looks very much state of the art- we were advised that it was around 15 years old! DAY 2- #PotPlantStudyTourOntario We started with Albert Grimm, head grower, Jeffery’s Greenhouses producing poinsettia now for the box stores and even do a promotion for Black Friday as part of the service to their client. Also a variety of pot forms and sizes to make attractive displays in store. We had a very stimulating discussion with the people there on how to deal with the need for promotion of the plants and increasing consumer interest in quality plants. From there to John Albers at Homestead Growers making Callas year round by combining product here with their other farm in Florida for the winter. A good talk from Richard Vollebregt on the principles of outdoor/indoor growing using a Cravo greenhouse with retractable roof. Finally we met our old friend Gideon Avigad at Vineland research who showed us some of the projects they are working on, including the irrigation decision support and automation. This is to be a topic for presentation by David Gholami at the Greenhouse Conference tomorrow. We also heard of new mite predators from Michelangelo La Spina. The Canadian Greenhouse Growers Conference organised by the growers organisation and held at the Scotiabank Conference Centre in Niagara is an annual event that gathers growers of all products to this area of intense activity in the Niagara peninsula. The combination of a large exhibition centre and a stimulating conference programme brings people together. The range and quality of the presentations was very useful and there seemed to be something for everybody on the study tour to hear. Poinsettia crops growing well, filling space on Schenck, Meyers and Spring Valley; lots for growers on the study tour to discuss . Once again the marketing strategies area prime interest and this particular trade is not generally a focus for the pay by scan marketing in the box stores as they recognise that it will be a low margin business and there is no place for the extra service cost. A large part of the total 7mpoinsettia produced in Canada come from this part of Ontario and a large percentage are exported all over the United States. Many of the businesses in this area have developed from 3 or 4 generations of, mainly Dutch, families emigrating from Europe starting in the end of the 19th century, with a large influx in the 1950’s. The older families have started with fruit and vegetables, developed cut flowers and now dominate pot plant production both seasonal and year round. They have developed large businesses and today are still investing large sums of money in new technology and production systems as well as automation which consists of labour replacement in a large part, pressured by increasing cost due to minimum wage increases and the difficulties of obtaining sufficient workers.